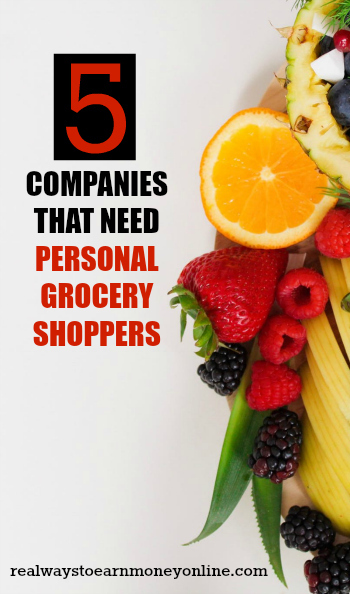 Personal Grocery Shopper Jobs – 5 Companies To Try! Published October 8, 2018 By Anna T. This post may contain affiliate links. Regardless, I only recommend sites I've researched and/or used and trust. Do you spend a lot of time browsing the aisles in your local grocery store? Have you ever thought it might be nice to get paid a little money for your efforts? If so, we've got good news for you. There are a number of new businesses popping up that will actually hire you to shop for groceries and deliver them to customer's homes. Some of these companies rely almost entirely on smartphone apps to interface with both their customers and their delivery personnel. The basic business model is a lot like that of many popular ride-sharing services. Customers use an app to browse through a virtual grocery store and place an order. The delivery drivers are independent contractors who use another app (or a special mode inside the same app) to claim the orders that interest them, while rejecting the ones that don't. Many of these jobs are extremely flexible – you can log in to start working whenever you want – and also fairly easy to get. The pay varies a lot depending on which service hires you, but some people apparently make between $15 and $20 an hour doing this kind of work, which is certainly nothing to sneeze at. That said, the rate of pay does NOT include gas reimbursements, wear and tear on your car, and you won't always have work available. So keep all of that in mind. If you need a job now, and you live in an area where one of these companies is hiring, it might not be a bad idea to at least give them a look. With all that in mind, we decided to do an overview of some of the more popular businesses in this niche and see what they have to offer. This company is similar to Instacart. Shoppers are independent contractors who fulfill grocery orders submitted through the Shipt phone app or website. Customers can contact you through the app while you shop to make adjustments to the order, and in some cases you may be asked to unload the groceries inside the person's house or even put them away. Pay seems to be extremely variable on a day-to-day basis, depending on all sorts of factors that are beyond the driver's control. Some people apparently make over $20 per hour on average, others seem to make around $13 per hour. Go here to register at Shipt. Shopping for groceries is only one small part of the job for a Postmates Fleet driver. If you get hired by this company, you'll also be delivering alcohol, retail items, fast-food orders, and all sorts of other things. You can work whenever you want for as long as you want, and the pay ranges from $11 to $20 per hour. Go here to register at Postmates. Instacart is one of the most prominent online grocery delivery services, and the most known on our list. They partner with a large number of well-known national grocery chains and offer special coupons to customers. Orders are placed primarily through the company's web page or the smartphone app. The working hours for delivery drivers are supposed to be fairly flexible, and the pay varies with over 63 salary reports stating around $12 an hour. If you don't have a car, or if you don't like delivery work, you might be able to land a job as an Instacart “in-store shopper.” This is a position which involves staying in the same store all day, gathering groceries, and bagging them up so that customers can drive-by and get them later. Because Instacart offers one of the more popular grocery shopper jobs, there are hundreds of reviews online from people who have done the work on both Indeed and Glassdoor. We encourage you to read through these prior to applying so you know what to expect. Go here to register at Instacart or check out our Instacart overview. Peapod is a little different than some of the other companies on this list. They're a grocery delivery chain store founded initially in Chicago, which has since expanded into quite a few major metropolitan markets. They have big warehouses full of groceries, and they hire people to gather customer orders so that delivery drivers can pick them up. With Peapod you won't have the same flexibility that some of the other grocery services offer. You'll have to work in the warehouse with management looking over your shoulder all the time, and you won't be able to set your own hours. Most Peapod personal grocery shopper jobs are part time, and they pay around $10 hourly. This company is very similar to Postmates in the sense that it's a lot more than just a grocery delivery service. A typical assignment could be anything from ordering a pizza to picking up someone's dry-cleaning, but it sounds like grocery shopping is one of the most common tasks. Favor drivers are called “Runners” and are encouraged to think of themselves as personal assistants. According to the hiring page, the pay ranges anywhere from $10 to $18 per hour, and they'll work with you to set up a schedule that fits with your lifestyle. Go here to register as a Runner for Favor. As you can see there's quite a bit of variety in this list. If you're looking for a flexible job where you can make money doing something fairly easy, you have several unique options to choose from if you want to be a personal grocery shopper. This kind of work can be a little unreliable because you never know how many orders you're going to get on a given day, but these jobs are often really good for people who already have a primary income source, and want something extra to bring in a few more dollars. For any kind of delivery work you'll definitely need a good car, and since you'll be working with the public in a very up-close and personal way – you may even need to enter people's homes – many companies will do a background check to make sure you don't have a criminal record. But if you can meet those basic requirements, it's supposedly pretty easy to land a gig in this particular niche. Many of these companies have a reputation for putting people to work really fast, and several pay on a weekly basis, so if you need money right now, this line of work might be a good thing to look into. Good luck if you pursue any of the opportunities above! Looking for my daughter, are these companies in Victoria, Australia.